In Kenya and elsewhere, the antibiotic landscape for healthcare and livestock production is shaped by poor regulation and irrational drug use. There is a need for related evidence-based policy and the implementation plans for such policy. Our partnership is conducting in-depth research on antibacterial resistance in clinical and community settings to understand patterns of resistance, transmission of bacteria and their resistance determinants and genome-based studies of resistance evolution. This combines with social and economic approaches to quantify the burden of antibacterial infection, the behavioural aspects of drug prescribing and use and the risks of mixing of bacterial populations between clinical settings, the community and the food systems that link them. Our approach is to build a strong network of antibacterial surveillance to monitor microbial ecology and identify hotspots of selective pressure. 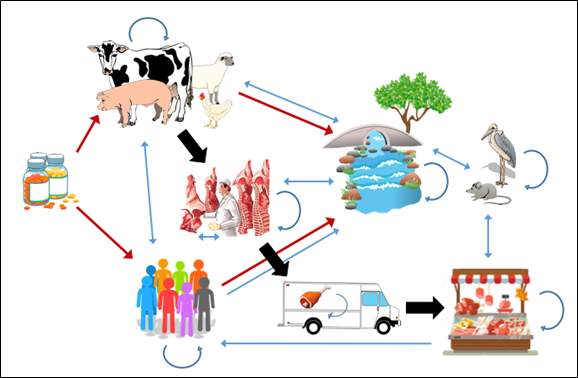 The transmission of AMR along the food value chain among people, environment and wildlife. Red arrows: flow of antibiotics. Blue arrows: transmission of resistant bacteria, rounded arrows symbolize transmission between individuals and cross-contamination. Black arrows: flow of meat (food value chain). This work is funded by the UK Cross Council Initiative on Antimicrobial Resistance in a Global Context, a call led by the Medical Research Council and UK Department of Health (https://www.mrc.ac.uk/funding/browse/antimicrobial-resistance-in-a-global-context1/antimicrobial-resistance-in-a-global-context-a-cross-council-call-in-partnership-with-the-department-of-health/).